So it’s a bit ironic that these creatures had their image rehabilitated by a device that tells you precisely were where you are—in time, anyway. An embossed sea monster is just one of the things that makes the Omega Seamaster a whimsical, yet classic, piece of design. The half-horse, half-fish Hippocampus of Greek Mythology has been embossed on the backside of the watch since 1958. It’s a fitting icon for a timepiece based on designs made for the Royal Navy during WWII and essentially serves as a secret handshake between the Seamaster and its wearer. Mythological beasts and world wars (not to mention its appearance on the wrists of two James Bonds) ensure that each Seamaster bears a historied origin story before it’s ever worn. But when the model’s provenance is combined with the personal history that can only come from a vintage piece, something inimitable happens. Fred’s inimitable timepiece happens to be a Swiss 1962 Omega Seamaster purchased from an American Indian Chief. When Fred first came by it, it still had a sterling silver and turquoise watch band. The hands told the time but the deep patina of the watch face told a different story; a tale of where it’d been and who it had known that can’t be divided into minutes or hours. It imbues a mechanical object with something that can’t be priced while simultaneously disproving the notion that a one-of-a-kind timepiece must carry an exorbitant price tag (most models in excellent condition can be found for just under $3,000). But no matter how Swiss it is, it’s still made up of moving pieces that require attention and care. When Fred realized his Seamaster was in need of servicing (i.e. the hands stuck at 11:17pm each day), he brought it to the city’s best—Grand Central Watch. The half-horse, half-fish Hippocampus of Greek Mythology has been embossed on the backside of the watch since 1958. As its name implies, the shop is located within New York’s premier transportation hub. It’s not exactly Platform Nine and Three Quarters, but its discovery requires a trip down the 45th Street Passage until you discover a wood-paneled shop built into its left wall. It’s there that Grand Central Watch has been restoring life to timepieces from previous decades, and sometimes, centuries, since 1962. Those 57 years of service have allowed Grand Central Watch to build a library of OEM parts that’s nearly unmatchable. In addition to having the pieces that can restore a 200-year-old pocket watch, they employ a team of experts skilled enough to use their bare hands in minute repairs when a tool might run the risk of damage. At the time Fred purchased his Seamaster, it lacked the date window magnifier that would have originally been part of the crystal (there’s an interesting story behind that, he’s sure). It came back from Grand Central Watch with the proper crystal and a pristine new date adjust window. He’s enjoying that once-again relevant feature of his watch along with the fact that whoever it comes to next will too. The air in 2019 is rife with four-letter words, and we’d rather not contribute to the chorus unless we really mean it. And in the case of the F*ck You Buck, made in collaboration with Blackstock & Weber, we most certainly do. So, why the French? We think it’s in keeping with the true spirit of the white buck, which today is viewed through too genteel of a lens. Before the white shoe became synonymous with garden parties and seersucker, it was the shoe of choice for college punks. That’s right, punks. White suede bucks were Dr. Martens before Dr. Martens. During the Jazz Age, rebellious Ivy League students would lace up white bucks with their tweed and flannels. From grass stains to beer splotches, they’d let their white bucks accumulate as much dirt as possible as a way of politely extending their middle finger towards the establishment. Perhaps that’s why the white buck feels like the missing link between Fred’s past and present. During his adolescent punk phase, Fred lived in Docs. So when the opportunity arose to design a shoe with Blackstock & Weber—another made in England shoe label—he saw it as a chance to revive the white buck’s punk spirit by infusing it with Dr. Marten-inspired details. What kind of details? For starters, we set our buck on a boot last that flaunts a bulbous toe box and a rounder profile akin to the original Dr. Marten 1461. We then bulked it up with metal eyelets, and a chunky, aggressive sole perfectly capable of kicking someone’s teeth in (of course, only when in dire straits). But we didn’t abandon any of the refined details that have kept the white buck a prep staple through the years. Its upper is made from supple white suede—not nubuck—and has a velvety nap. In keeping with tradition, its chunky Ridgeway sole is made from brick-red rubber with an art deco tread pattern. The other features are in line with quality shoemaking (and as Blackstock & Weber employs a third-generation Northampton workshop, we’d expect nothing less). You may know the drill: all-over calfskin leather lining, traditional Goodyear cork lining, and a storm-welted Goodyear construction that seam-seals the outsole, keeping out moisture (i.e. Negronis) and the elements (i.e. other people’s Negronis). And yet, these carefully considered details will have been in vain if only worn to your annual Derby Day party. We designed the F*ck You Buck for everyday wear through dilapidated downtown subways, on post-dinner strolls, and for snuffing out American Spirits greedily smoked all the way down to the filter. The nappy white suede is primed to bare every scuff, scrape, and stain until they’re as lived-in as the threadbare Persian rug on your living room floor. Wear your F*ck You Bucks after Labor Day…especially after Labor Day. And if anyone doesn’t like it, well, let your shoes deliver your French for you. Women We Love is a chance for us to interrogate sit down with the women in our lives whose style we love, work we admire, and heart we adore. We give them the celebrated Proust Questionnaire—which dates back to 19th-century Parisian salons—and throw in a few of our own. Grab a coffee, something to take notes with, and get to know the women we love as they ponder love, death, and the meaning of life. Without further ado, Svenja Frisch. What is your current state of mind? Enlightened. When and where were you happiest? Driving home from my favorite beach club (Le club 55) into a setting sun with open windows, sandy feet, wet hair, swimsuit, and blasting “Champagne Supernova” (obviously singing along). What is your greatest fear? Public transportation. What is your greatest extravagance? Only one? Silk pajamas. Which quality do you most desire in a pair of jeans? Absolutely no stretch—stiff as a carton box. Which quality do you most desire in a man? I love a great cook. Which quality do you most desire in a woman? Humor. What do you consider to be the most overrated virtue? Modesty. What is the trait you most deplore in yourself? Impatience. What is it that you most dislike? Queuing. Aka standing in line, for the American readers. Which historical figure do you most identify with? Loulou de la Falaise (1947-2011). She was best known as Yves Saint Laurent’s muse, confidante, alter ego—and the virtuoso behind all his famously flamboyant accessories: towering fur toques, clanking bronze cuffs, necklaces strung with coral. Adventurousness typified not only her designs but also her approach to the art of living, in homes of distinguished pedigree in England, Ireland, France, and Italy. Her style had nothing to do with money, and everything to do with taste and imagination. What is your most marked characteristic? My laugh. I giggle a lot, it’s very high pitched. In which season do you feel most beautiful? Fall…because of the golden autumn light. What do you dislike most about your appearance? My forehead. If you could change one thing about yourself, what would it be? Acquire a better posture. Which talent would you most like to have? I would love to be a better singer and fluent in french. What is your favorite occupation? Day dreaming. On what occasion do you lie? When the situation requires a lie. Who was the last person that gave you flowers? My neighbor. If you could change one thing about your family, what would it be? To be less neurotic, they remind me of characters in a Woody Allen film. What is your most treasured possession? The rings my parents gave me for my 21st and 25th birthday. I never take them off, not even to shower. What do you consider your greatest achievement? Simultaneously surviving puberty and high-school. What do you most value in your friends? Loyalty and our shared appreciation for Rihanna. Who is your favorite fictional hero? I only have real heroes. Ok, who is your favorite real hero? My great grandfather. Where would you like to live? On a small farm nearby Ramatuelle, France with chickens and maybe two goats in my garden. On the weekend, I’d live in pajamas and cook for my friends. We’d have the grandest of summer parties until the early mornings, dancing barefoot to Fleetwood Mac. How would you like to die? Dancing barefoot in my garden in the south of France. If you could choose what to come back as, what would it be? Maybe a yacht? What is your motto? Santé! Kids can be cruel. A select few possess a preternatural gift for it. In hindsight, the first revelation of this truth was when a student entered the classroom with newly prescribed glasses. In the early 90s, few things could be as socially damning to a prepubescent as a prescription for corrective lenses. “Pointdexter.” “Geek.” “Milhouse.” And that unimaginative mainstay, “Four Eyes.” Since age 13, Fred’s been in glasses. At 16 he realized he could turn what was a liability into an asset and enthusiastically adopted a bold, tortoise acetate frame. Since then it’s been a 20-year revolving door of thick tortoise specs. They’ve become a signature of sorts, growing larger with each passing year. The latest sojourn on that pilgrimage is Kirk Originals, a crafter of sunglasses and optical glasses that are designed in London and then painstakingly made by hand in England, Italy or France (three countries that know a thing or two about style). Margate optical ($302), archival tortoise sunglass, and Monte Carlo optical ($262). The company’s DNA goes back to 1919, the year its namesake founders chose to leave behind the garment and button business for the eyewear one. Kirk Originals came about in the 1990s, when a trove of mod-era Kirks were discovered in a trunk. Liam Gallagher wore Kirk Originals during his famed Glastonbury Festival performance in 1994, and soon pairs were decorating the nose bridges of Morrissey and Mick Jagger. Ritchie has a psychological explanation for their success. 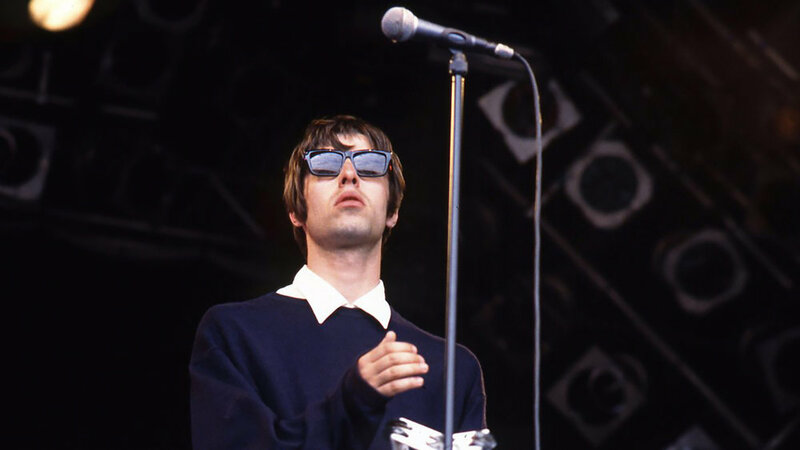 Liam Gallagher, Oasis frontman, wearing Kirk Originals at 1994's Glastonbury Festival. The mid-century, architectural designs of the Made in England collection by Kirk Originals were enough to make us fall in love—even before we heard the story of their construction. It begins with cellulose acetate, the plant-based, nearly mystical synthetic compound used by the best eyewear makers. The type Kirks uses come from Mazzucchelli 1849, an Italian maker with six generations of experience. From start to finish, each pair of glasses is made by a single craftsmen. The process begins by hand-dyeing the acetate, which is then cut into shape. Once the desired shape has been achieved, the acetate is heated and pressed in a mold to build the bridge. Then the real fun starts: the shaping and carving of the glasses with a hand file, which takes a full 72 hours and ends with smooth, remarkably round edges. The thickness of the acetate—an impressive 8mm—makes such shaping possible, and allows the temples to be installed without any visible pins, thus preserving the ultra-clean, modernist look. The process ends with enough buffing and polishing to turn the final product into a reflective surface: perfect for a discreet teeth check after broccoli rabe. After all of that, the glasses are finally in our hands. But when we position them on our noses and tuck the edges behind our ears, brushing away errant locks of hair and adjusting burglar caps, we’re not ourselves anymore. The rounded edges of the Mason channel David Hockney as we venture to the bodega for Advil. The Aviator-style Reed allows us to be Steve McQueen for an afternoon, no chase scenes required. The Harvey in tortoiseshell turns a coffee run into a live-action remake of North by Northwest. Kirk Originals aren’t simply accessories that block UV rays or make cocktail menus in dimly lit bars readable. The dedicated carving process transforms each pair into something more: a disguise. And as any moonlighting private eye can attest, selecting the right disguise is key. It is no secret that looking good, or actually looking right, is not high on the cultural curriculum of the American male. That’s a shame, really. This sartorial epidemic can partially be attributed to most men’s lack of style icons, or muses—whether it be one’s father (the ideal), celebrities, or simply a stylish gentleman. Personal style starts there though...muses; individuals, characters, or attitudes (past and present) you are drawn to. We’ve recently employed—and consequently become addicted to—Instagram’s story “highlights.” One highlight in particular, labeled “Muses”, effectively collages images of our, well…muses. Stanley Marcus, former Neiman-Marcus president and CEO, believed that good taste could be acquired through environment and education, that the eye could be disciplined to differentiate between good and bad by a constant looking process. And that’s what it’s about, a constant looking process that eventually becomes a matter of instinct. We’ve got a soft spot for impractically. And when it comes to footwear, nothing rivals the Prince Albert slipper for its outright rejection of utility in favor of decor. You certainly don’t need a velvet upper with a hand embroidered monogram to get yourself from here to there—but it makes getting there a lot more fun. Stubbs & Wootton continues to uphold this old-world art from their home base of Palm Beach, Florida. The slipper-maker was founded in 1993, but feels as if it belongs to another time. Part of that trick is their reverence for traditional shoemaking methods. The other is their borrowing the surnames of two English artists from the 18th century, George Stubbs and John Wootton. The two were famous for their equestrian scenes, making them appropriate namesakes for a brand whose product is inexorably linked to aristocratic excess and flair. Each pair is meticulously hand-crafted by artisans in Southern Spain and comes fully leather lined, complete with a leather outsole and a short stacked heel. They offer a variety of ready-to-wear styles, ranging from a discreet, solid black velvet to leopard print needlepoint to embroidered smoking joints. Fine choices, all; but their bespoke program is where the possibilities are, well…endless. First you’ll choose your style of embroidery: monogram, motif, varsity-style sweater letters, or International maritime signal flags. Then you’ll pick from their signature classic evening slipper last or a square-toed UK last with a higher vamp. Once that’s put to bed, the real fun begins—starting with fabrics. In designing this bespoke pair, Fred supplied Stubbs & Wootton with suiting fabric and tie silk for the commission. 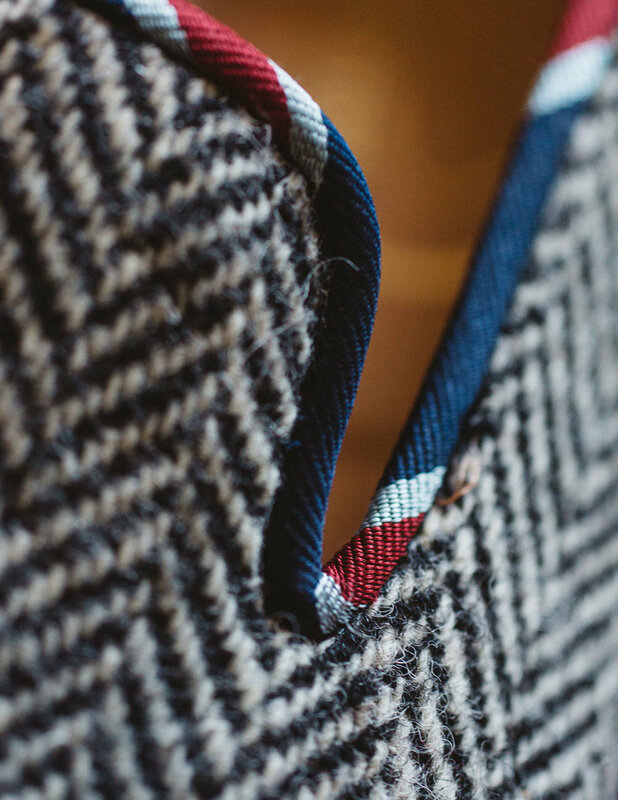 He began with a grey herringbone Harris Tweed cloth, set it on their UK last, and then trimmed it with an English repp stripe silk. Then, throwing all caution to the wind, Fred had his monogram hand stitched in 14K gold bullion, a type of metal thread. English repp stripe silk piping. Hand embroiderd 14K gold bullion monogram. Goldwork, the art of embroidery of metal threads, is particularly prized for the way light plays on it. Originally developed in Asia more than 2000 years ago, its use reached a remarkable level of skill in the Middle Ages when a style called Opus Anglicanum was developed in England and used extensively in church vestments and hangings. After this period, it was then routinely employed in the clothing and furnishings of the royalty and nobility throughout Europe. Today, it’s increasingly difficult to find anyone adept in goldwork. It’s time consuming, expensive, and laborious. Did we mention expensive? Especially when working with 14K gold. It’s a modern day go-to-hell move for the genteel. This maxim, issued by the founder of E. Marinella, comes from a man submerged in neckwear. And yet it speaks to our own ethos concerning the tie. We don’t need them to keep us warm, protect us from the elements, or to wipe our mouths with (though feel free to do so with any Ralph Lauren factory/outlet tie). They serve a higher purpose. As Glenn O’Brien reasons in How to Be a Man, “The tie’s only function is beauty. 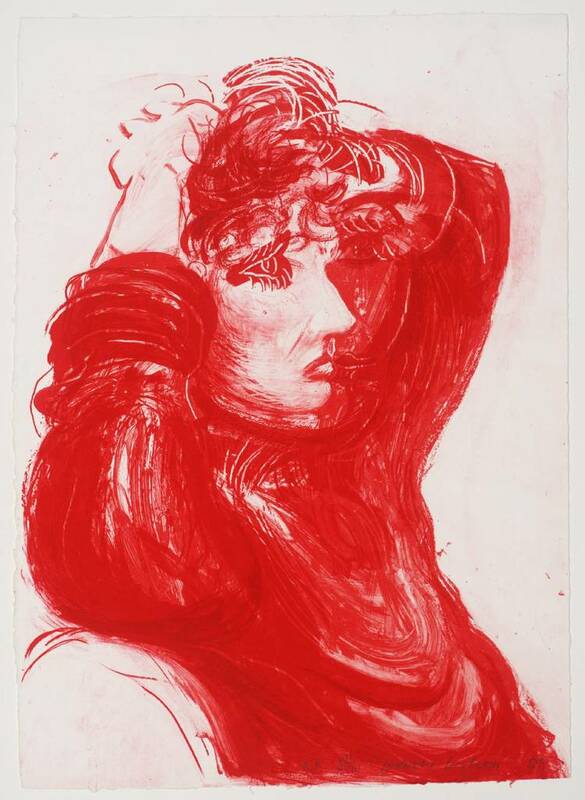 It is an emblem of art and artifice.” And art is anything but rational. It’s true that ties have become a rarer sight in our ever more casual world, but we’re not complaining. We’d rather see the necktie embraced by those wearing them out of free will rather than compliance. And if you’re anything like us, there’s no point in volunteering for tie duty unless you’re going to wear the very best—and that brings us to Drake’s. The London maker offers scores of new ties with each season. And while the colors, patterns, and prints offer more diversity than a Brown admissions brochure, each collection is united by a triptych of details that have collectively become known as sort of a Drake’s signature. Almost all feature hand-rolled edges, a flared back blade, and—perhaps the most noticeable peculiarity—blades without tipping. “Tipping” refers to the fabric that backs most modern ties at each blade’s end. While the de rigueur practice of the day, tipping was historically seen as slightly suspect, as if it were concealing lazy craftsmanship. By intentionally foregoing tipping, Drake’s casually pulls off the sartorial equivalent of a humble brag. The result is a relaxed—you might even say “floppy”—gait that emphasizes the hand-rolled edges, flared back blade, and devil-may-care rakishness of its ancestor, the cravat scarf. Fred wears Drake's green sailing print silk and cotton tie with our made-to-measure khaki cotton suit. Highlights from the Spring '18 season employ interesting fabrics from Drake’s enormous offering. There are vibrantly colored tile and medallion prints in Panama silk, a lightweight textile known for its open, textural weave, matte finish, and remarkable knack for retaining bright hues. There is an orange mini circle and diamond print imbued with the luminosity unique to foulard silk. An abstract, rounded square print in navy uses the chalky power of madder silk to leave its mark. It’s nearly impossible to pick a favorite. But if you really press us, we’ll shamelessly admit to fawning over these preppier designs: the medallions, the dots, the motif of a green sailing boat emblazoned on a silk/cotton blend. It’s just the right mix of texture, sheen, and weight and pairs perfectly with our English khaki cotton suit. The entire collection is so beautifully designed that you can be irrational in your choice and yet still be rationally dressed.